Switching to a Solahart is one of the best things you can do to reduce your household energy consumption. And there’s a model to suit every home, regardless of where you live. You’ll enjoy big savings on your energy bill and you’ll be helping the environment. 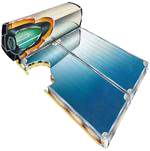 All Solahart collector panels are coated with a dark, heat-absorbent surface. This coating absorbs the sun's rays and heats the fluid in the collector panel. As the fluid heats, it rises to the top of the collector panel and into the tank where it displaces cooler fluid which flows in to the bottom of the collector panel where the process is repeated. In open circuit systems the fluid in the collector panelis water while in closed circuit systems a special antifreezefluid is used. When heated in the collector panel, it is circulated in a jacket around the tank to transfer the heat to the water inside. Closed circuit systems are recommended for frost prone areas or in situations with poor water quality. 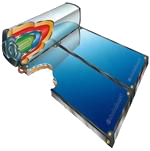 In this way Solahart Solar hot water systems constantly soak up the sun's energy to maximize your energy savings. 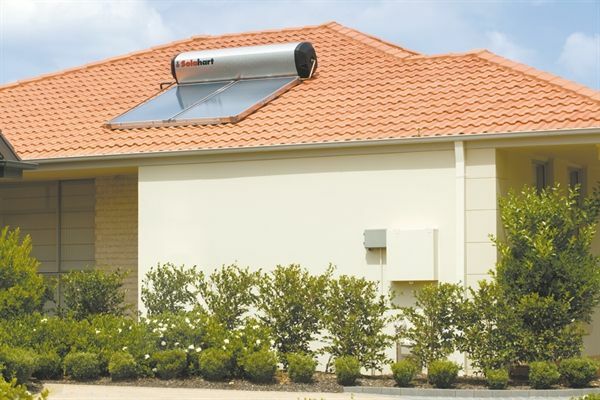 With a Solahart Thermosiphon solar water heating system you can choose from a range of boosters including in-tank electric or gas boosters to ensure you always have hot water on tap even on cloudy days.